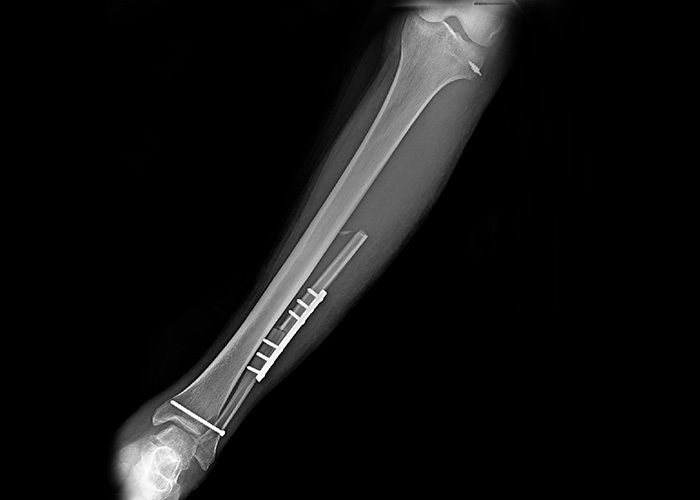 Speciality Trauma,Arthroscopy,Sports injuries and Shoulder specialist. 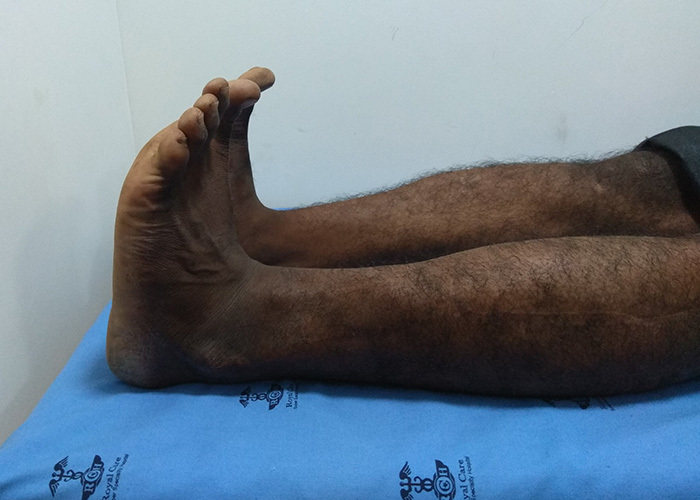 Dr.Dinesh has done his residency in Orthopaedic surgery from level 1 tertiary trauma centre – Madras Medical College - where state of art surgeries are being performed and which is a referral centre for all complex trauma and sports related injuries. 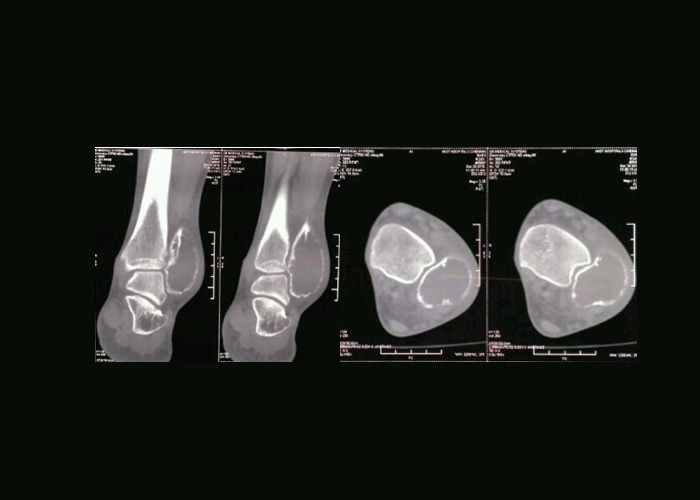 He has keen interest in Shoulder and complex trauma including pelvi-acetabular fractures. 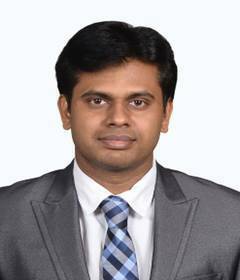 He has presented his research work in various state and national level conferences. He has performed a study on “Modified Bristow’s repair in patients with Recurrent Anterior Shoulder Instability” during his residency. 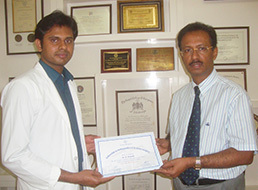 He has completed his Fellowship in Orthopaedics & Trauma Surgery (FOTS) at Ganga Hospital, Coimbatore. 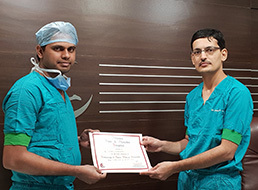 He is the first surgeon in India to complete trauma fellowship in the prestigious Ganga hospital under the guidance of Dr.S Rajasekaran and Dr.J Dheenadhayalan. 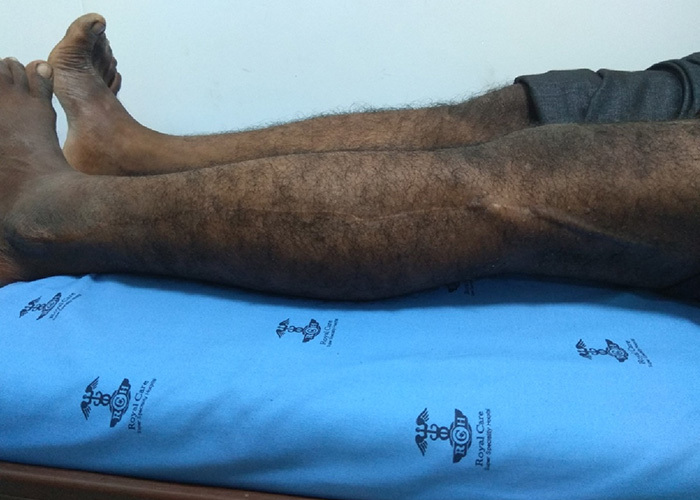 He has also completed his Fellowship in Arthroscopy and Sports Medicine (FASM) at Ahmedabad, under the guidance of Dr.Prathmesh Jain. He is one of the very few surgeons in India who has completed his international fellowship under the renowned shoulder surgeon Prof. Eiji Itoi in Tohoku university, Sendai, Japan. 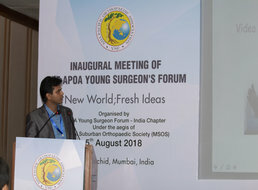 He is trained with most advanced surgical techniques in shoulder such as arthroscopic superior capsular reconstruction for massive irrepairable rotator cuff tears, reverse total shoulder replacement and anatomical total shoulder repalcement for glenohumeral arthritis in Japan. He is now based in Royal care Superspeciality hospital, Neelambur which is a level 1 tertiary trauma centre, equipped with advanced infrastrucutre where he has performed major trauma and arthroscopic surgeries. His main motto is to deliver quality services for the betterment of the injured. 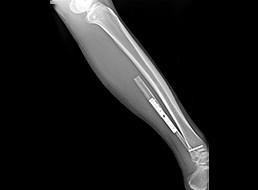 Reconstruction of ankle mortise following resection of giant cell tumor of distal fibula. 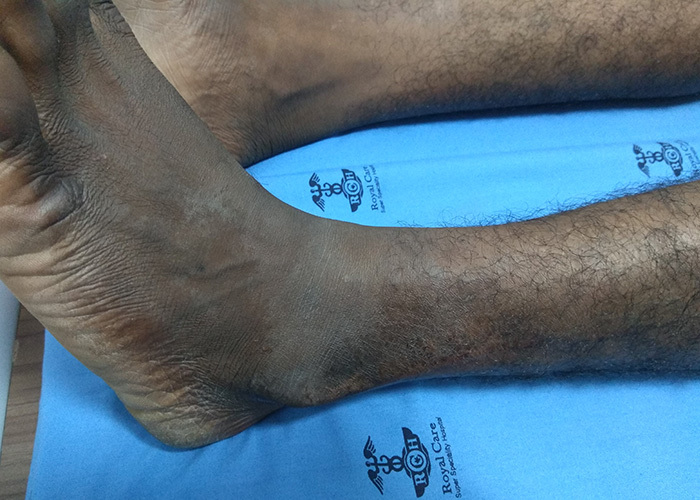 Journal of Clinical Orthopaedics July-Dec 2018; 3(2):51-53.DINESH CHIDAMBARAM, Sengottaiyan P, Chinnaswami K.
25 yrs male pt came to our hospital with complaints of pain and swelling over the outer aspect of left ankle for 12 months. 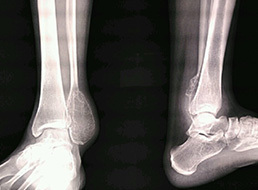 On examination there was a diffuse swelling over distal third fibula with classical egg shell cracking consistency [Fig. 1]. 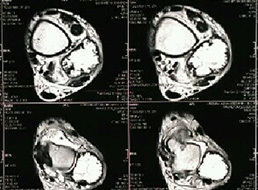 Imaging with X ray, CT and MRI revealed eccentric, expansile, lytic lesion with cortical breech [Fig. 2]. 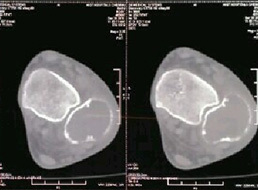 Thus a preoperative diagnosis of Giant Cell tumor was made. Chest X ray and CT Chest were normal. 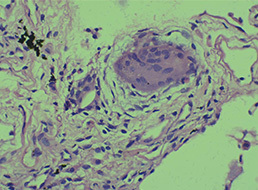 Trucut Biopsy revealed features suggestive of Giant Cell Tumor [Fig. 3]. 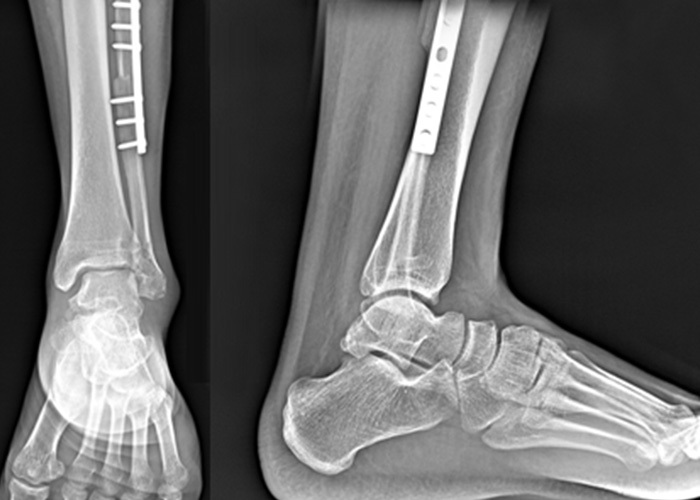 Locally aggressive tumor in an expendable bone warrants resection of distal fibula to prevent recurrence, which compromises ankle stability. 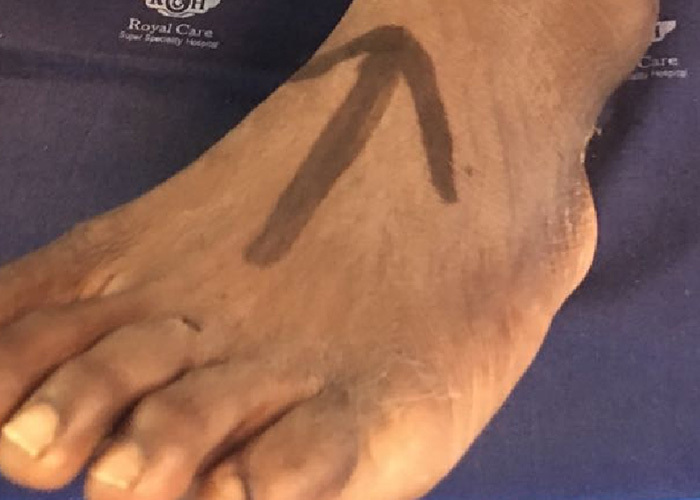 So wide resection of the distal fibula was done [Fig. 4]. 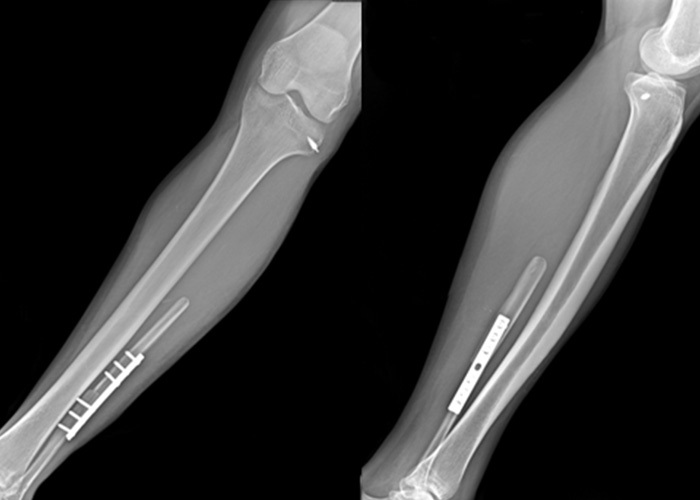 Proximal fibula is harvested after careful dissection and isolation of common peroneal nerve [Fig. 5]. 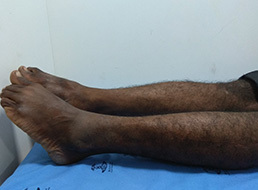 Biceps femoris tendon and fibular collateral ligament were secured with suture anchor to lateral proximal tibia to avoid lateral knee instability. 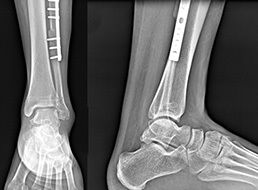 Finally, ankle mortise is reconstructed with ipsilateral proximal fibula after reversing it so that fibular head acts as valgus stabiliser and fixed to the middle third intact fibula with 3.5 dynamic compression plate and screws [Fig. 6]. 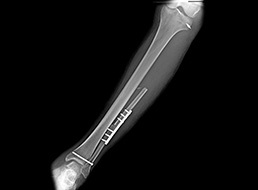 Syndesmotic screw is used to secure the reversed fibula for additional stability. 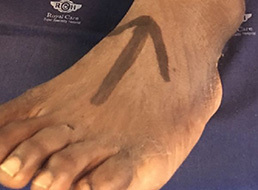 Remnants of lateral collateral ligament and biceps femoris were sutured to the lateral capsule of ankle joint. 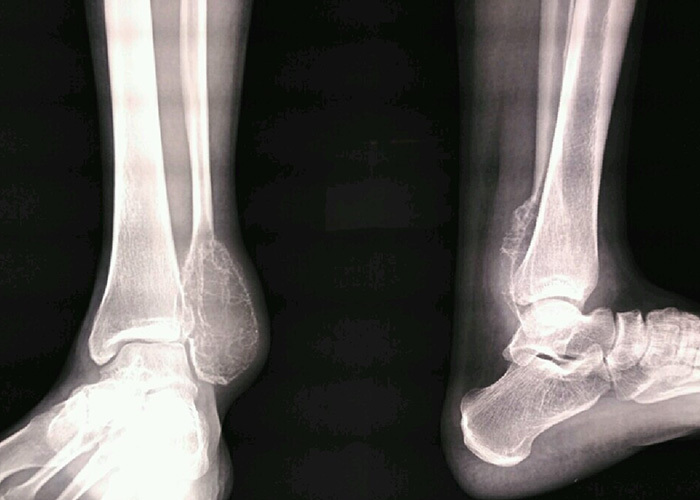 Immediate postoperative X ray shows good tumor clearance [Fig. 7]. 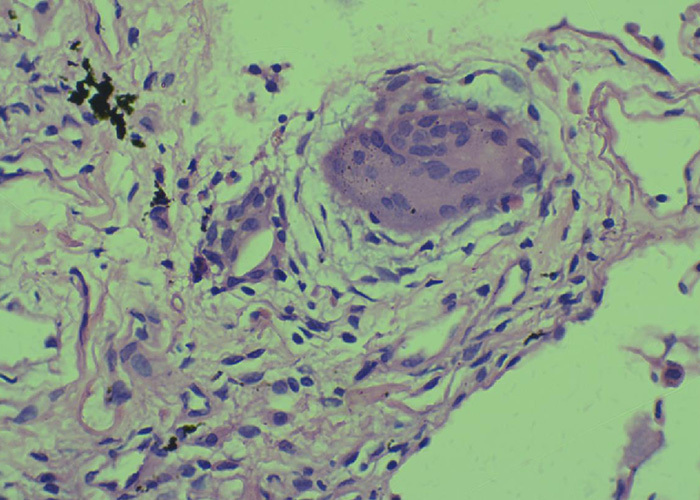 Excision biospy revealed Giant cell tumor with margins free of tumor invasion [Fig. 8]. 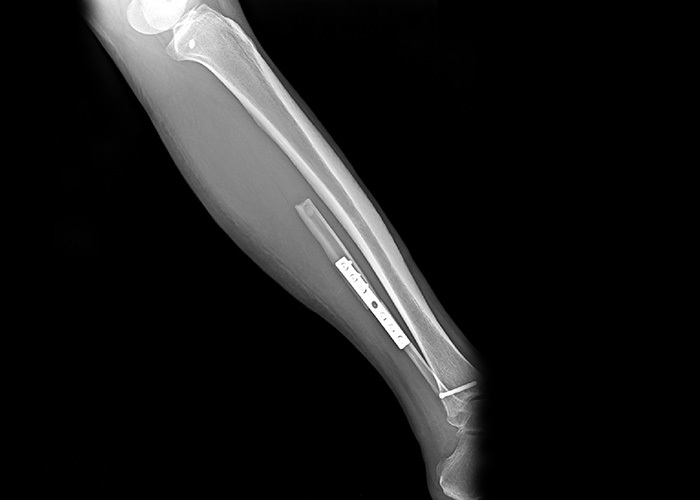 Patient was mobilised non weight bearing for 12 weeks. 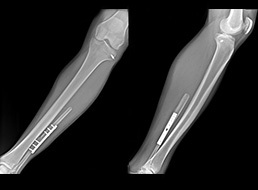 Syndesmotic screw was removed at 12 weeks and gradually allowed to bear full weight. At one year follow up, there is no recurrence locally [Fig. 9]. 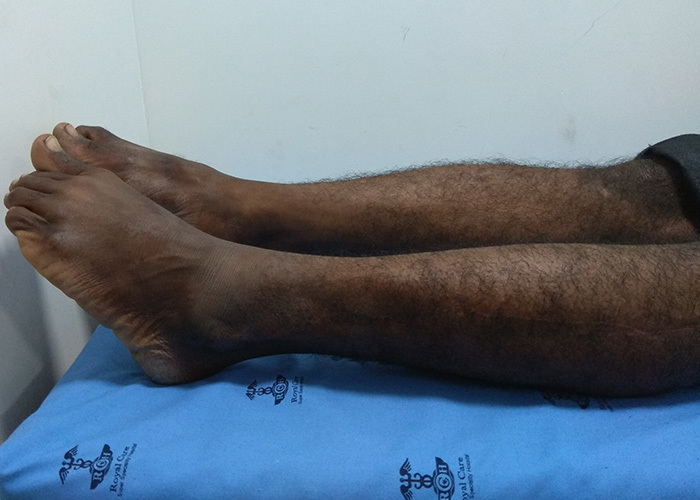 He walks without any support and on varus stress test with knee in 30 degree flexion, there is no lateral opening of knee joint. 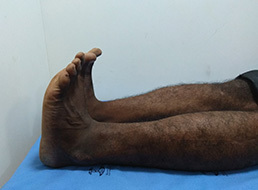 His knee and ankle range of movements were normal [Fig. 10]. 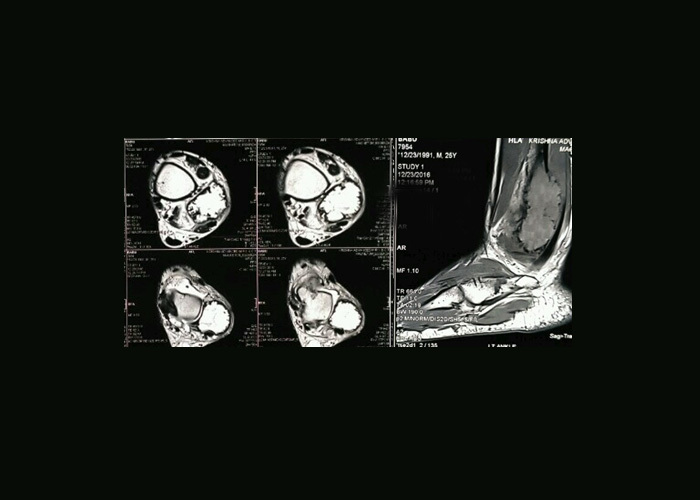 Mean MSTS (musculoskeletal tumor society score) was 100%. 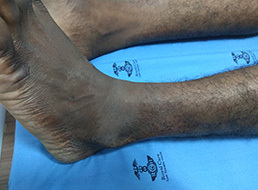 Owing to high recurrence rate, resection of tumour in toto and to enable the patient with good ankle stability, reconstruction of ankle mortise with ipsilateral proximal fibula and securing biceps femoris and fibular collateral ligament with suture anchor to lateral proximal tibia for lateral knee stability is an appropriate mode of management especially in young patients.